Finally! A recipe for quinoa ( keen-wah for the pronunciation challenged) that’s easy and full of flavor. Perfect for a meatless main dish or side dish and quick to put together. I loved this so much I want to make it again tomorrow! Rinse quinoa in a fine mesh sieve; set aside to drain. Heat olive oil in a 3 quart saucepan over med-high heat. Add garlic and mushroom and cook until mushroom is tender. Stir in stock, water, sun-dried tomatoes, lemon juice, onion powder, basil, salt and pepper. Cover and heat to a boil. Stir in quinoa. Cover, reduce heat to low and simmer 10-15 minutes, or until thickened and the most of the liquid is absorbed. Increase heat to medium. Stir in broccoli. Cover and cook 5-10 minutes or until broccoli is crisp-tender, stirring occasionally. 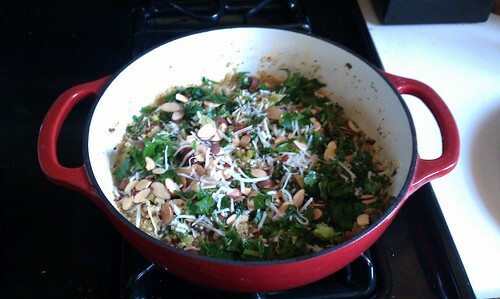 Spoon into serving bowl and garnish with parsley, Parmesan and almonds.